For the Capital Inicial album, see Das Kapital (album). For the Doug Anthony Allstars TV series, see DAAS Kapital. Capital: Critique of Political Economy (German: Das Kapital, Kritik der politischen Ökonomie, pronounced [das kapiˈtaːl]; 1867–1883) by Karl Marx is a foundational theoretical text in communist philosophy, economics and politics. Marx aimed to reveal the economic patterns underpinning the capitalist mode of production, in contrast to classical political economists such as Adam Smith, Jean-Baptiste Say, David Ricardo and John Stuart Mill. In Capital: Critique of Political Economy (1867), Marx proposes that the motivating force of capitalism is in the exploitation of labour, whose unpaid work is the ultimate source of surplus value. The owner of the means of production is able to claim the right to this surplus value because he or she is legally protected by the ruling regime, through property rights (the historical section shows how these rights were acquired in the first place chiefly through plunder and conquest and the activity of the merchant and "middle-man"). In producing capital (produced goods), the workers continually reproduce the economic conditions by which they labour. Capital proposes an explanation of the "laws of motion" of the capitalist economic system, from its origins throughout its future, by describing the dynamics of the accumulation of capital, the growth of wage labour, the transformation of the workplace, the concentration of capital, commercial competition, the banking system, the decline of the profit rate, land-rents, et cetera. Wage-labour is the basic "cell-form" (trade unit) of a capitalist society. Moreover, because commerce, as a human activity, implied no morality beyond that required to buy and sell goods and services, the growth of the market system made discrete entities of the economic, the moral, and the legal spheres of human activity in society; hence, subjective moral value is separate from objective economic value. Subsequently, political economy — the just distribution of wealth and "political arithmetick" about taxes — became three discrete fields of human activity: Economics, Law, and Ethics, politics and economics divorced. "The economic formation of society [is] a process of natural history", thus it is possible for a political economist to objectively study the scientific laws of capitalism, given that its expansion of the market system of commerce had objectified human economic relations; the use of money (cash nexus) voided religious and political illusions about its economic value, and replaced them with commodity fetishism, the belief that an object (commodity) has inherent economic value. Because societal economic formation is a historical process, no one person could control or direct it, thereby creating a global complex of social connections among capitalists; thus, the economic formation (individual commerce) of a society precedes the human administration of an economy (organised commerce). The structural contradictions of a capitalist economy, the gegensätzliche Bewegung, describe the contradictory movement originating from the two-fold character of labour, and so the class struggle between labour and capital, the wage labourer and the owner of the means of production. These capitalist economic contradictions operate "behind the backs" of the capitalists and the workers, as a result of their activities, and yet remain beyond their immediate perceptions as men and women and as social classes. The economic crises (recession, depression, etc.) that are rooted in the contradictory character of the economic value of the commodity (cell-unit) of a capitalist society, are the conditions that propitiate proletarian revolution; which the Communist Manifesto (1848) collectively identified as a weapon, forged by the capitalists, which the working class "turned against the bourgeoisie, itself". In a capitalist economy, technological improvement and its consequent increased production augment the amount of material wealth (use value) in society, while simultaneously diminishing the economic value of the same wealth, thereby diminishing the rate of profit — a paradox characteristic of economic crisis in a capitalist economy; "poverty in the midst of plenty" consequent to over-production and under-consumption. After two decades of economic study and preparatory work (especially regarding the theory of surplus value) the first volume appeared in 1867: The production process of capital. After Marx's death in 1883, Friedrich Engels introduced, from manuscripts and the first volume; Volume II: The circulation process of capital in 1885; and Volume III: The overall process of capitalist production in 1894. These three volumes are collectively known as Das Kapital. Capital, Volume I (1867) is a critical analysis of political economy, meant to reveal the contradictions of the capitalist mode of production, how it was the precursor of the socialist mode of production, and of the class struggle rooted in the capitalist social relations of production. 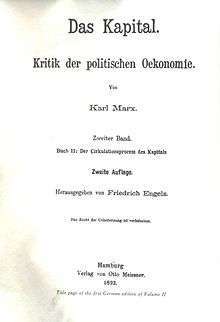 The first of three volumes of Das Kapital, Kritik der politischen Ökonomie (Capital: Critique of Political Economy) was published on 14 September 1867, dedicated to Wilhelm Wolff, and was the sole volume published in Marx’s lifetime. Capital, Volume II, subtitled The Process of Circulation of Capital, was prepared by Friedrich Engels from notes left by Karl Marx and published in 1885. It is divided into three parts: The Metamorphoses of Capital and Their Circuits, The Turnover of Capital, and The Reproduction and Circulation of the Aggregate Social Capital. In Volume II, the main ideas behind the marketplace are to be found: how value and surplus-value are realized. Its dramatis personae, not so much the worker and the industrialist (as in Volume I), but rather the money owner (and money lender), the wholesale merchant, the trader and the entrepreneur or 'functioning capitalist.' Moreover, workers appear in Volume II, essentially as buyers of consumer goods and, therefore, as sellers of the commodity labour power, rather than producers of value and surplus-value (although, this latter quality, established in Volume I, remains the solid foundation on which the whole of the unfolding analysis is based). Reading Volume II is of monumental significance to understanding the theoretical construction of Marx's whole argument. Marx himself quite precisely clarified this place, in a letter sent to Engels on 30 April 1868: :In Book 1 ... we content ourselves with the assumption that if in the self-expansion process £100 becomes £110, the latter will find already in existence in the market the elements into which it will change once more. But now we investigate the conditions under which these elements are found at hand, namely the social intertwining of the different capitals, of the component parts of capital and of revenue (= s)." This intertwining, conceived as a movement of commodities and of money, enabled Marx to work out at least the essential elements, if not the definitive form of a coherent theory of the trade cycle, based upon the inevitability of periodic disequilibrium between supply and demand under the capitalist mode of production (Mandel, 1978, Intro to Vol. II of Capital). Volume II of Capital has indeed been not only a 'sealed book', but also a forgotten one. To a large extent, it remains so to this very day. Part 3 is the point of departure for a topic given its Marxist treatment later in detail by, among others, Rosa Luxemburg. Division of Profit Into Interest and Profit of Enterprise, Interest Bearing Capital. The work is best known today for part 3, which in summary says that as the organic fixed capital requirements of production rise as a result of advancements in production generally, the rate of profit tends to fall. This result, which orthodox Marxists believe is a principal contradictory characteristic leading to an inevitable collapse of the capitalist order, was held by Marx and Engels to, as a result of various contradictions in the capitalist mode of production, result in crises whose resolution necessitates the emergence of an entirely new mode of production as the culmination of the same historical dialectic that led to the emergence of capitalism from prior forms. The purpose of Capital: Critique of Political Economy (1867) was a scientific foundation for the politics of the modern labour movement; the analyses were meant "to bring a science, by criticism, to the point where it can be dialectically represented" and so "reveal the law of motion of modern society" to describe how the capitalist mode of production was the precursor of the socialist mode of production. The argument is a critique of the classical economics of Adam Smith, David Ricardo, John Stuart Mill, and Benjamin Franklin, drawing on the dialectical method that G. W. F. Hegel developed in Science of Logic and The Phenomenology of Spirit; other intellectual influences on Capital were the French socialists Charles Fourier, Comte de Saint-Simon, Sismondi, and Pierre-Joseph Proudhon; and the Greek philosophers, especially Aristotle. At university, Marx wrote a dissertation comparing the philosophy of nature in the works of the philosophers Democritus (ca. 460–370 BC) and Epicurus (341–270 BC). The logical architecture of Capital: Critique of Political Economy is derived in part from the Politics and the Nicomachean Ethics by Aristotle, including the fundamental distinction between use value and exchange value, the "syllogisms" (C-M-C' and M-C-M') for simple commodity circulation, and the circulation of value as capital. Moreover, the description of machinery, under capitalist relations of production, as "self-acting automata" derives from Aristotle’s speculations about inanimate instruments capable of obeying commands as the condition for the abolition of slavery. In the nineteenth century, Karl Marx’s research of the available politico-economic literature required twelve years, usually in the British Library, London. At the time of his death (1883) Karl Marx had prepared the manuscript for Capital, Volume IV, a critical history of theories of surplus value of his time, the nineteenth century. 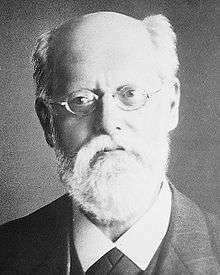 The philosopher Karl Kautsky (1854–1938) published a partial edition of Marx's surplus-value critique, and later published a full, three-volume edition as Theorien über den Mehrwert (Theories of Surplus Value, 1905–1910); the first volume was published in English as A History of Economic Theories (1952). 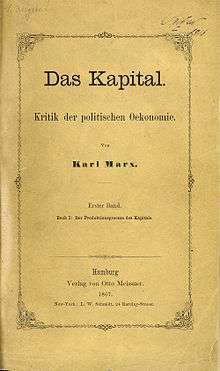 Capital, Volume I (1867) was published in Marx’s lifetime, but he died, in 1883, before completing the manuscripts for Capital, Volume II (1885) and Capital, Volume III (1894), which friend and collaborator Friedrich Engels edited and published as the work of Karl Marx. The first translated publication of Capital: Critique of Political Economy was in Imperial Russia, in March 1872. It was the first foreign publication; the English edition appeared in 1887. Despite Tsarist censorship proscribing "the harmful doctrines of socialism and communism", the Russian censors considered Capital as a "strictly scientific work" of political economy the content of which did not apply to monarchic Russia, where "capitalist exploitation" had never occurred, and was officially dismissed, given "that very few people in Russia will read it, and even fewer will understand it"; nonetheless, Karl Marx acknowledged that Russia was the country where Capital "was read and valued more than anywhere". The Russian edition was the fastest selling. 3,000 copies were sold in 1 year while the German edition took 5 years to sell 1,000, the Russian translation thus selling 15 times as fast as the German. In the wake of the global economic collapse of 2008–09, Marx's Capital was reportedly in high demand in Germany. In 2012, Red Quill Books released "Capital: In Manga! ", a comic book version of Volume I which is an expanded English translation of the wildly successful 2008 Japanese pocket version Das Kapital Manga de Dokuha. The foreign editions of Capital: Critique of Political Economy (1867), by Karl Marx, include a Russian translation by the revolutionary Mikhail Bakunin (1814–1876). Eventually Marx's work was translated into all major languages. An English translation by Samuel Moore and Edward Aveling was reissued in the 1970s by Progress Publishers in Moscow; a more recent English translation was made by Ben Fowkes and David Fernbach (the Penguin edition). 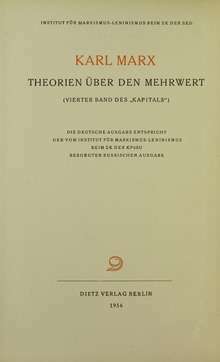 The definitive critical edition of Marx's works, "MEGA II" (Marx-Engels Gesamtausgabe), includes Das Kapital in German (and French, for the first volume) and shows all the versions and alterations made to the text, plus a very extensive apparatus of footnotes and (cross-)references. Capital, Volume I: The Process of Production of Capital, from Marxists Internet Archive. Capital, Volume II: The Process of Circulation of Capital, from Marxists Internet Archive. Capital, Volume III: The Process of Capitalist Production as a Whole, from Marxists Internet Archive. 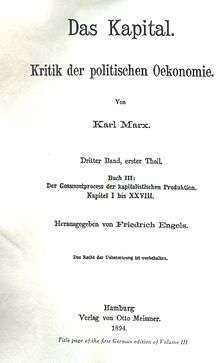 ↑ Marx, Karl (1867). Das Kapital : Kritik der politischen Oekonomie. 1 (1 ed.). Hamburg: Verlag von Otto Meissner. Retrieved 15 June 2016 – via e-rara.ch (ETH-Bibliothek Zürich). ; Marx, Karl (1885). Das Kapital : Kritik der politischen Oekonomie; herausgegeben von Friedrich Engels. 2 (1 ed.). Hamburg: Verlag von Otto Meissner. Retrieved 15 June 2016 – via e-rara.ch (ETH-Bibliothek Zürich). ; Marx, Karl (1894). Das Kapital : Kritik der politischen Oekonomie; herausgegeben von Friedrich Engels. 3 (1 ed.). Hamburg: Verlag von Otto Meissner. Retrieved 15 June 2016 – via e-rara.ch (ETH-Bibliothek Zürich). ↑ Marx, Karl. Capital: The Process of Capitalist Production. 3d German edition (tr. ), p. 53. ↑ Marx credits Aristotle for being the "first to analyze... the form of value." In addition, he identifies the categories of use and exchange value with the Aristotlean distinction between the Oeconomic and the Chrematisitic. In the Politics, the former is defined as "value in use," while the latter is defined as a practice in which exchange value becomes an end unto itself. "Marx, Capital Vol. 1, trans. Ben Fowkes (New York: Knopf Doubleday, 1977), 68, 253, f. 6. ↑ Capital, Vol. 1, trans. Fowkes (Knopf Doubleday, 1977), 446. ↑ Columbia Encyclopedia, Fifth Edition (1994) p. 1707. ↑ Ostler, Nicholas. Empires of the Word: A Language History of the World. HarperCollins: London and New York, 2005. ↑ "BBC NEWS - Europe - Marx popular amid credit crunch". ↑ Yasko, Guy (2012). Capital: In Manga!. Red Quill Books. ISBN 978-1-926958-19-4. Archived from the original on February 25, 2016. Retrieved February 25, 2016. ↑ Marx's 'Das Kapital' comic finds new fans in Japan. Japan Today. Dec. 23, 2008. Althusser, Louis (1969) How to Read Marx's Capital from Marxism Today, October 1969, 302-305. Originally appeared (in French) in Humanité on April 21, 1969.